So I had been planning to say that this was one of the best HOS/Adventure games I have played to date and perhaps I still feel that way. Music and graphics were excellent. Storyline was straightforward but intriguing and stayed spooky without being dark or creepy. The HOS and mini-games were easy but fun. The HOS items were well done and interesting, although I did get tripped up a couple of times trying to find a "divider" which turned out to be an old fashioned compass. HOWEVER, as the game play began to reach the end things started acting flaky. One cut scene locked up in the parent's bedroom and would not go away - good thing the game was done with the room by then. One mini-game shortly after that locked up so I had to hit skip, which I do not like to do. The strategy guide completely omitted one section having to do with obtaining a wheel for the final mini-puzzle, so the time I actually did get stumped I had to go elsewhere for help. Lastly, at the end and in the bonus game, there was a lot of running back and forth getting tools then finding out they needed to be sharpened before used. -Don't really get the value of repeatedly backtracking to sharpen tools. Once used as usual, the tools would go away only to have to be reacquired in a HOS later on. - and for the record, at the end of game as well as in bonus play there is a LOT OF HOS required to continue. Fortunately the beautiful artwork and music took some of that tedium away. The game ending was abrupt as was the end to the bonus play which is too bad as everything was staged for a very dramatic and memorable close. Minus the buggy behavior and repeated backtracking from room to room, I'd love to see more games like this one. Again - graphics, artwork beautiful, music and all else were extremely well done. I definitely recommend this game. This is game is worth every dime and then some. It is the first CE that I have played where the bonus game was not some afterthought just so its creators can call it a collector's edition. The graphics are lovely and interesting and the story has a surprising depth. It took me multiple hours to play even though it had 'sparkles' and no expert level. Indeed, my only criticism is the lack of choice of expert play. Everything else is spectacular. I have close to 400 BF games. For overall quality and attention to detail this was one of the best. This is definitely a game I can play more than once. 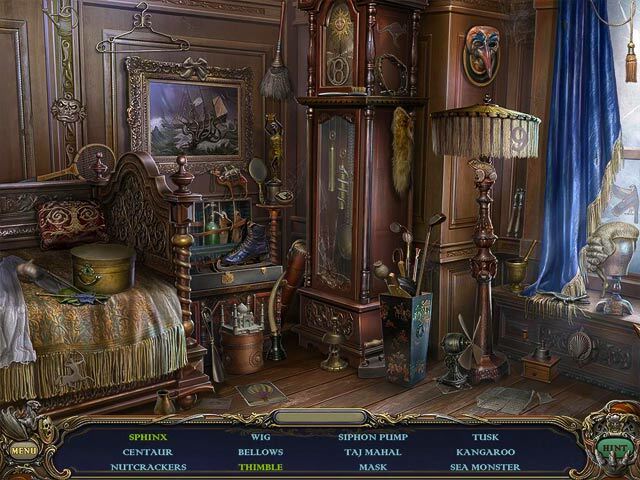 Most of the hidden objects were very close to the period of the story. I really liked the variation and continuation of the story from the first Haunted Manor. It was interesting from start to finish and the bonus did not seem like a tack on but very much a part of the story. This is one game where I definitely would prefer the Collectors edition over the standard edition because of the bonus chapter. Finally a game that has it all ! Gorgeous graphics, beautiful music (Mozart's Requiem, you can't miss), usually I don't listen to the music I find it boring, except for The Great Gatsby, but it's really a major player in this game. I played only 15 minutes knowing right at the beginning that I will buy it. The game does not come in widescreen. There is no voice-over. There is no choice of casual or advanced mode - the game only plays with sparkles. There is no journal and no map. There is a choice of custom and system cursor. I would recommend using the custom cursor, because the system cursor is static and won't change when you move over different areas. The graphics are great, and so is the gameplay. The puzzles are nicely done, and the SKIP button doesn't take forever to fill up. 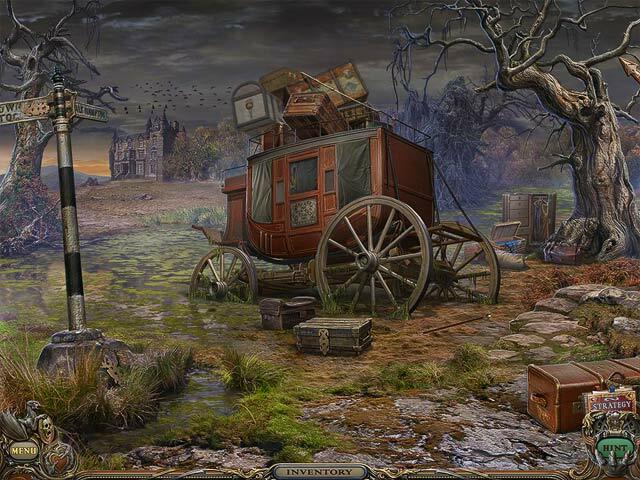 The HINT button also works outside of the HOS (Hidden Object Scenes#, and is very helpful when you are stuck - an arrow will show you where you have to go to next. The main game was a good length, and the bonus game took me a good hour to complete. 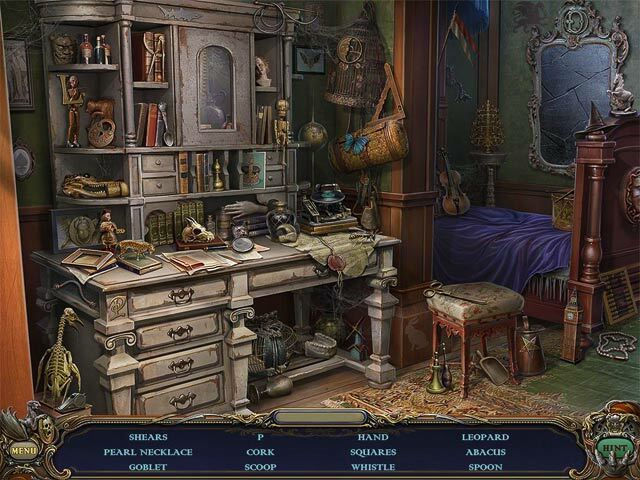 All in all, I had a wonderful time playing this game, and recommend it to anyone who is a HOG #Hidden Obejct Game) fan. Beautiful graphics, lots to do! Some objects in HO scenes are very small but still fairly easy to see. There were a lot of puzzles I had never seen before and enjoyed them all. Loved the music, it fit the scenes very well. Didn't mind not having voice overs, they're not always good. I'm not familiar with this developer but I thought this was a very high quality game and I'm looking forward to more from them. I would recommend this to anyone who like HO adventure games. Pros: Amazingly clear graphics that did not take an age for my 7-year-old computer to load. Interesting gameplay, a good variety of mini-games, and HO scenes that were pretty much true to the story and time period. Skip button available on the mini-games. Story was not overly original but interesting enough. Music did not irritate, if it does, there is a music volume option. I hate voice overs in general, usually with bad actors and worse fake British accents, this had none. Good length - hours of game play for me, and a well thought out bonus game. Cons: The story scenes were slow to load the text: I'd start thinking it was like a comic book without text and hit "next" just as the text started to appear. Irritating. Hint button recharge was really really slow. For those who care (I don't, I nearly always play Casual level) there did not appear to be different skill levels. Couple of times mini-game puzzle instructions were confusing enough that I had to use the strategy guide to see what was the expected outcome. In general, I had a lot of fun with this game. It took several sittings to complete, although I was tempted to play straight through. I will probably play it again for the games thatwere difficult or that I (shamefully) had to skip because I was tired of trying. Just finished this game & could easily play it again right now! Lovely graphics & music - but more importantly a story that is really compelling & pulls you right in! Mind you, this is not a happy tale, but one that makes you want to finish the game & fight the nastiness! This is a game that keeps you thinking, you may want to takes notes as you go - but the Strategy Guide is well done and will help you if you get lost in your travels (which can happen as you get caught up in the story and visuals!). Lots of bonus play in this Collector's Edition! That combined with the chance to save some lovely art as wallpaper surely make this worth the CE price. So stop reading & start downloading - see for yourself what a gem this game is! This prequel is even better! I was part of the Beta test for this game and I loved it! I only buy games occasionally but this one was a winner. This a prequel and a wonderful idea where you are one of the twin sisters. The puzzles and HO scenes were a perfect challenge for me.